The polymerase chain reaction (PCR) is a process that can turn a single copy of a gene into more than a billion copies in just a few hours. It gives medical researchers the ability to make many copies of a gene whenever they want to genetically engineer something. For years, the very structure of DNA made studying it rather challenging. After all, DNA is incredibly long and very tiny. Fortunately, the advent of DNA technology, the tools and techniques used for reading and manipulating the DNA code, has made working with DNA much easier. Scientists can even combine DNA from different organisms to artificially create materials such as human proteins or to give crop plants new characteristics. They can also compare different versions of the same gene to see exactly where disease-causing variations occur. 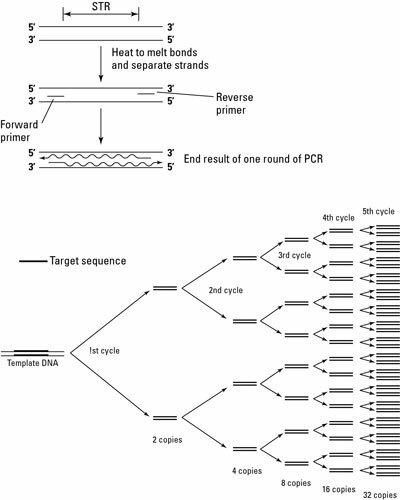 PCR targets the gene to be copied with primers, single-stranded DNA sequences that are complementary to sequences next to the gene to be copied. To begin PCR, the DNA sample that contains the gene to be copied is combined with thousands of copies of primers that frame the gene on both sides. DNA polymerase uses the primers to begin DNA replication and copy the gene. The basic steps of PCR are repeated over and over until you have billions of copies of the DNA sequence between the two primers. PCR works a little like chain e-mails. If you get a chain e-mail and send it on to two friends, who each send it on to two of their friends, and so on, pretty soon everyone has seen the same e-mail. In PCR, first a DNA molecule is copied, then the copies are copied, and so on, until you have 30 billion copies in just a few hours.